Recycled Megaphones Personalized in Bulk with Custom Imprint or Blank. Promotional, Very inexpensive. Lowest prices in the USA and Canada. 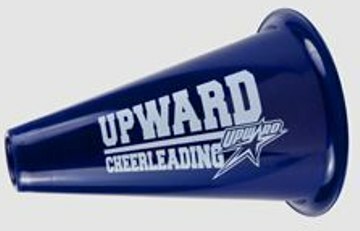 Bulk recycled megaphones, custom imprinted with your logo or blank (not custom imprinted) . Your advertising message will come across loud and clear with our megaphones. Printed with safe, durable UV ink. Our promotional, nature friendly sports megaphones are molded from 100% recycled, biodegradable plastic material. We also supply wholesale blank (not imprinted) recycled megaphones for $0.79 each. Budget Prices in the USA and Canada for wholesale recycled megaphones . American clients pay no taxes, Canadian clients don't pay PST. We will send you a proof for your approval before production. Second Side or Wrap Imprint: No additional charge for 1 color imprints. Setup Charge is $40.00 per color. You may order any in-between quantity; assortment of colors is allowed. Production Time: 7 days after art approval; Rush Production of 3 days: add $0.22 per megaphone. Colors: Black, Gray, Eco Dark Green, Eco Navy Blue, Eco Tan: see picture.